Edy's / Dreyer's Take the Cake is back! Sure it's only a limited flavor, but I know a lot of you are probably pretty stoked right now. Edy's Take the cake originally debuted as an American Idol tie-in flavor waaaaaay back in 2007. Wow, I've been avoiding this flavor for a long time hehehehe... oh, come on now. If you know me then you know I bought the following flavor for one reason and one reason only: my daughter. 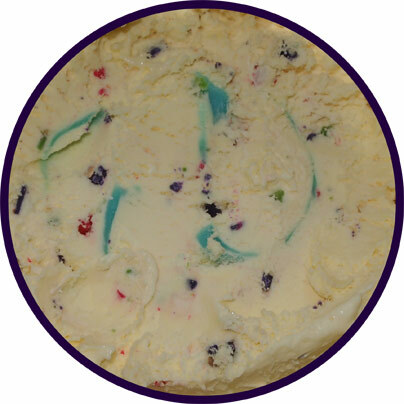 Take the Cake is Yellow cake flavored light ice cream mixed with blue frosting swirl and bursting with multi-colored sprinkles. Oh how I never like cake flavored ice creams, but my daughter, she loves 'em, so here goes. Check out the funky sugar shards! This last photo is about halfway down the container and you have to admit it looks fun.... but I still don't like it. It's just too much for me and the light gummy texture doesn't help me at all. Sure the little one is happily scooping the last remaining bits from her bowl, but I was good after a few bites. The big sugar flakes do add some crunch. The blue swirl does add more of a sugar high, but it's also really strange. It's very, well.... it looks like cool mint toothpaste gel. The ice cream was melting fast while the gel was sticking together and fighting my ice cream scoop with all its might. It was both funny and scary at the same time. So, that's that. Cake lovers have a low cal choice, and people like me will buy something else, but like I said, this container belongs to my daughter. In fact, she has already polished it off. Your kids will be excited too. 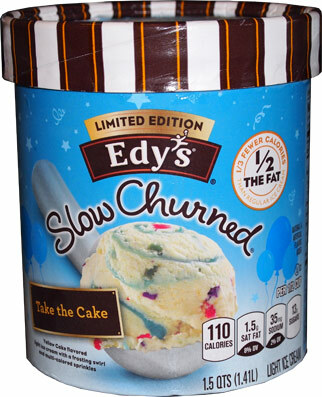 I have had the original "Take the Cake" by Edy's when it first came out and I think this is a slightly different recipe than the original since the caloric content is different. I know you hate cake flavors Dubbs but I love 'em and still think TH wins this battle! I really enjoyed Breyer's Blast Birthday cake version better than this one. I think it lacks a real cakey flavor (from know cake pieces) and just tastes like vanilla, gummy ice cream with sprinkles. Speaking of ice creame and cake flavors, I'm not sure anything beats those TasteyKake flavors Weis has the rights to. I heard you on the Nosh Show and checked out your site. Awesome reviews! This is the third cake based ice cream I've had, and it...reminded me of Chinese bakery birthday cakes. Blech. The gumminess, like you said, turned me off too. I prefer Cold Stone's cake batter ice cream. Also, is this ice cream the background of the blog? Just wondering, lol. I have bought this twice now, and I really like this flavor. I have had the Cold Stone Cake Batter ice cream and thought it was too sweet, but this one doesn't seem to be as offensive. Wow, it hardly seems possible that those AI flavors came out six years ago! I remember feeling reticent about the Take the Cake flavor then, just as I did in the store today, so I ended up buying the new German Chocolate flavor, plus French vanilla--boring, but a great blank canvas for sundaes or ice cream sodas (I love it with orange or grape). I agree that yellow cake-flavored ice cream looks and sounds better than it tastes, and that maybe it's best to keep ice cream and cake separate, though some brands have put out good red velvet ice creams. The Birthday cake flavor, I find it disgusting wish I could get my money back. 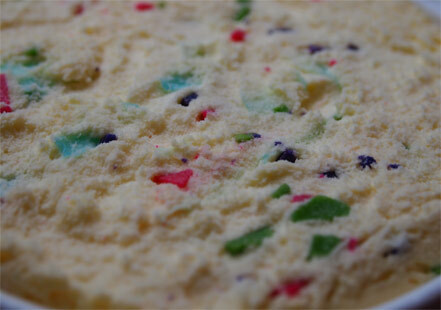 It's now called Birthday Cake Ice Cream. The very best ice cream flavor I can get my hands on. (since Blue Bell quit making the best seasonal flavors ever, Krazy Cookie Dough, and Christmas COOKIES-BEST EVER) I love it and eat a half a carton a day. But for some reason I can't find it anywhere this week. It's only been at the dollar general around here in GA. I hope it isn't discontinued. Would be nice to know if anyone could tell me. @JP: Yes, the very beginning of the article states the rename. Also, if the only place you can find a flavor is at some kind of dollar store, that means all the regular grocery stores have stopped carrying it and you are getting what the company is dumping off. So considering that and the fact that it's off of Edy's website, it seems like a safe bet it's gone (at least for now).